Early summer in my real life neighbourhood, and our garden is all about roses. The newest rose in my garden is the beautifully fragrant Parfum de Grasse – a hybrid tea rose that was developed in France in 2007. It is named after Grasse – a city in Provence, considered by some as the perfume capital of the world. In Second Life, our rose breeding program recently produced 3 new tea rose cultivars, Tangerine Dream, Pink Love and Forever Pink. Tangerine Dream’s orange-red blooms wow you with their reverse yellow shading, and are complemented by peach gypsophyla. Strong stems with waxy deep green foliage add height to the bouquet. The vibrant tones of the Pink Love tea rose are offset by the delicate light pink of Forever Pink. Meticulously sculpted and textured blossoms stand proud above a deep pink-hued gypsophyla. Both bouquets are displayed in crystal vases with gently rippling animated water surface. And they do not need watering! 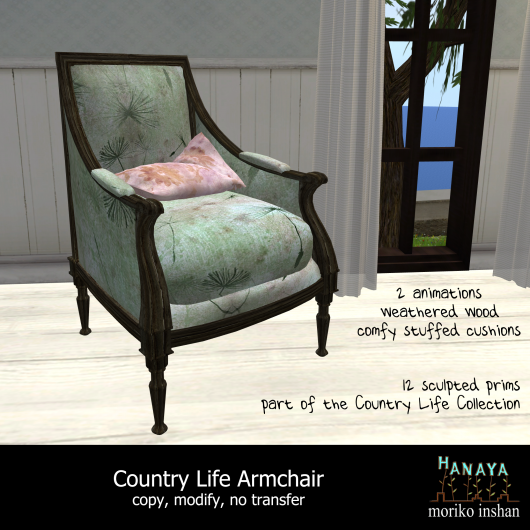 Summery fabrics and weathered dark wood are part of the -Hanaya- Country Life furniture series. The overstuffed armchair is perfect for indoors or on your terrace, patio or balcony. Includes 2 menu-driven unisex animations. Look for matching Country Life pieces at our in-world store, or on the Second Life Marketplace. This entry was posted in Product Announcements on June 19, 2012 by moriko. 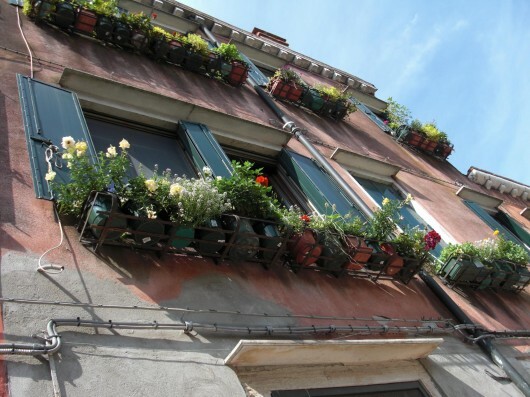 Fresh from a sunny, warm and bright real life vacation in Italy, we are back with lots of ideas inspired by the wonderful gardens of Bellagio and other lovely locations in and around Lake Como, Verona and Venice. 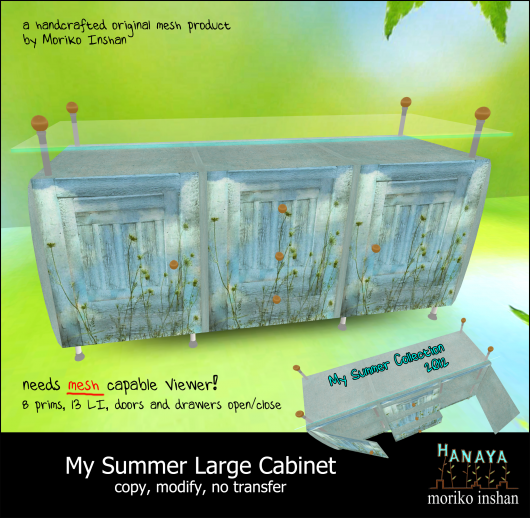 Our new summery furniture and decor mesh product line, My Summer 2012, will bring whimsical, lovingly handcrafted home and garden decor to your Second Life. 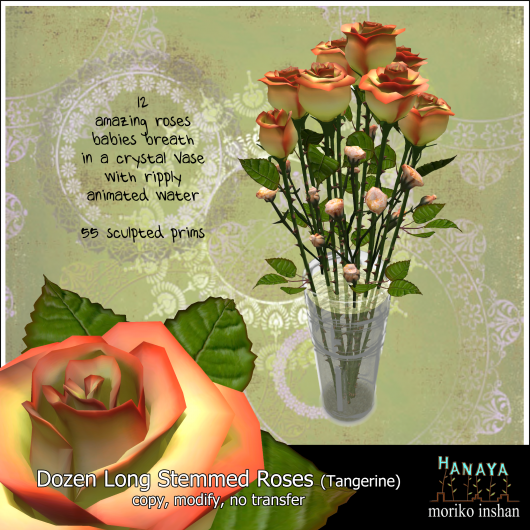 All pieces are original designs by the -Hanaya- team – you won’t see them anywhere else on the grid. The two doors and three drawers of the My Summer Large Cabinet are cunningly inset into the cabinet front, providing a beautiful yet functional piece of furniture. All doors and drawers open at a touch. Placed in your bedroom, living room or dining room, there is plenty of space for your treasured objects on top of the cabinet’s beveled glass top or below it on top of the unit. At only 8 prims and 13 Land Impact points, it is a lovely way to bring a breath of summer into your home. 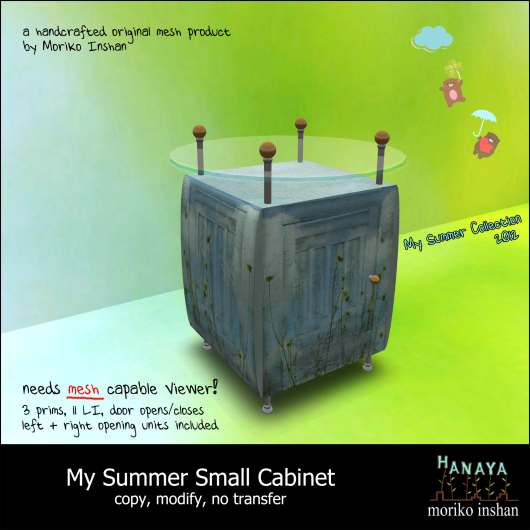 To introduce the new collection, the My Summer Small Cabinet is currently available as a gift for the VIP group members of -Hanaya- Yummy Collectibles in-world group. The set includes both left and right-opening versions, along with a beveled glass top and interior shelf. 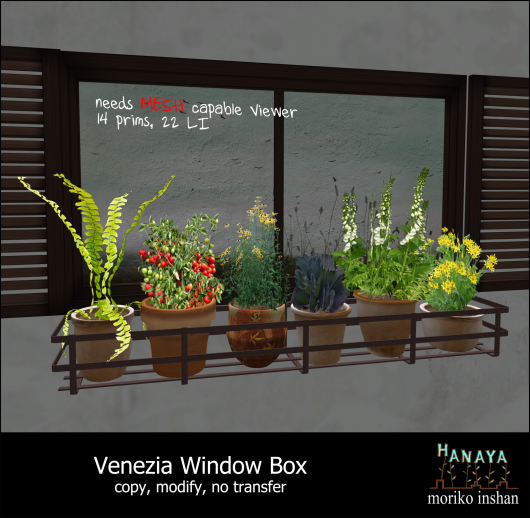 To get your copy, stop by the -Hanaya- in-world store and look for the piece in our Customer Information area. Not a VIP group member? The piece will be available for sale to the general public at the end of June. Last but not least, a big giant thank you to everyone that visited our storefront at the Home & Garden Expo last month. Your generous donations for Relay for Life and purchases of our products (many of which were brand new for the event) were a wonderful surprise on our return from vacation. The pieces that were at the Expo will slowly make their way into our in-world store and to the Second Life Marketplace. Have a sunny, warm and sparkly weekend! 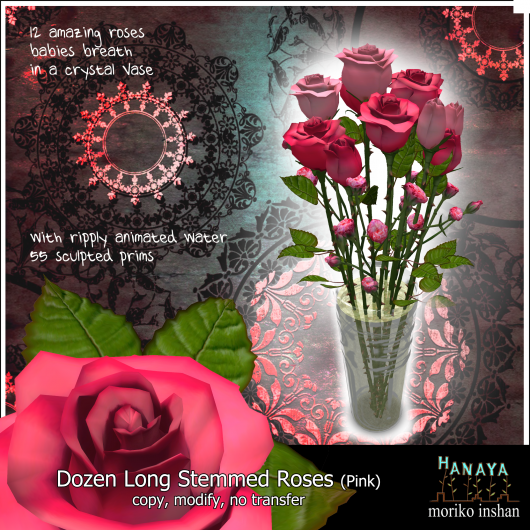 This entry was posted in Freebies and Gifts, Product Announcements and tagged My Summer on June 9, 2012 by moriko.